Ingredients: aqua (water) / eau, lithothamnium calcareum powder, propylene glycol, octyldodecanol, peg-7 glyceryl cocoate, kaolin, triethanolamine, sorbitol, titanium dioxide, carbomer, phenoxyethanol, parfum (fragrance), methylparaben, xanthan gum, propylparaben, ethylparaben, hexyl cinnamal, amyl cinnamal, ci 19140 (yellow 5), ci 42090 (blue 1). 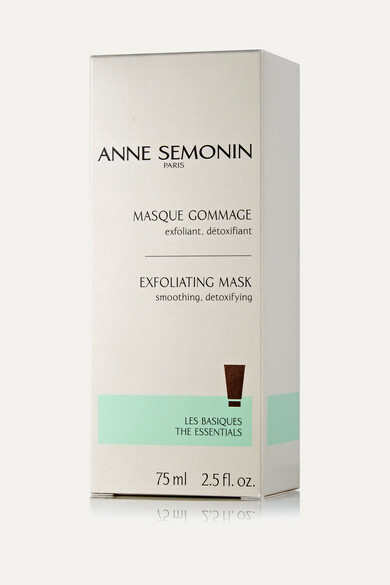 Anne Semonin originally treated clients at L'Atelier de Beauté in Paris - the brand's signature spa is still a popular beauty destination after 30 years of practice. Developed to bring that same experience into your home, this dual-purpose mask deeply cleanses and gently exfoliates to reveal a radiant, smooth complexion. It's formulated with astringent Red Seaweed and mattifying Kaolin to remove impurities and dissolve excess oil.